To say I’m flattered would be a gross understatement. If you’re serious about keeping the Senate in the hands of adults who have the judgment to oversee a war, follow Hugh Hewitt’s advice. I just did, and it’s the most effective $250 I’ve spent in a long, long time. 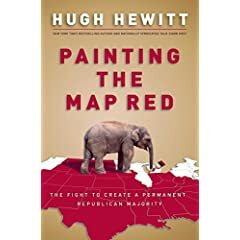 Hugh Hewitt has a new book out. Click on the picture. Buy the book. Read it. Then lend it to a Democratic friend who hasn’t got a terminal case of Moore’s Disease. Or, send a copy or two to your resident local Bush-bashing faux-objective lefty journalist. It’s the Adopt-A-Leftie-Journalist project! Based on Hugh’s fine past work, I ordered two copies from Amazon.com. One will go to my very good friend currently stationed in Germany. Hopefully, Hugh can slip an intellectual crowbar between my buddy and his reflexively Democratic voting tendencies. Hugh, what’s a fellow Buckeye gotta do to get an autographed copy?